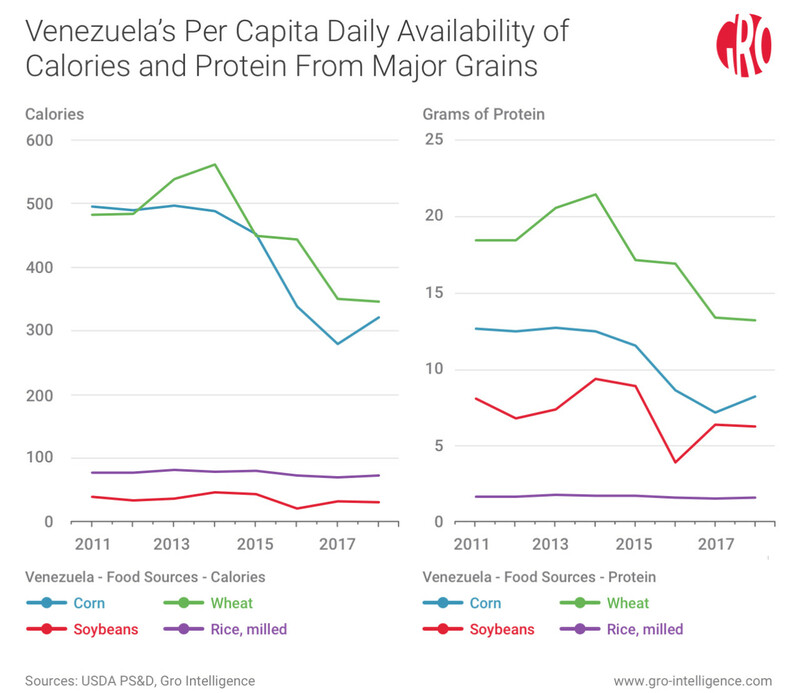 In this Weekly Insight, we pull together a variety of public data to assess the strains on Venezuela’s food supplies. We analyze trends in domestic consumption of traditional staples, such as corn, rice, and wheat. We also examine shifts in domestic food production, volumes of imported food, and where it is coming from. 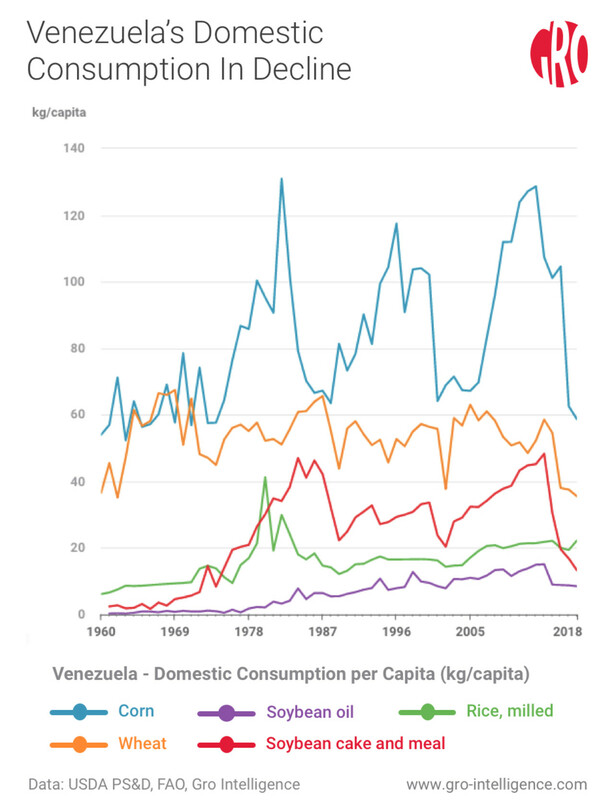 This chart highlights the top 5 agricultural products consumed in Venezuela since 1960. Domestic consumption per capita of corn, wheat, and soybeans has declined sharply since 2013. Consumption of all major grains for all uses has declined in the past five years. Looking at just human consumption, converting these declines into numbers of calories and grams of protein shows that the average Venezuelan’s daily caloric intake has dropped 36 percent for both corn and wheat since 2013. In other terms, Venezuelans are getting an average of 180 fewer calories from corn each day and 190 fewer calories from wheat. The story is similar with regard to protein derived from grain. The availability of calories and grams of protein rose in 2018, as favorable weather in Portuguesa, a major corn-producing region, contributed to Venezuela’s highest corn yields in nearly a decade and corn imports rose from the previous year. Factoring out corn used for feed, seed, and industrial processes, some 1.035 million tonnes of corn were available for human consumption in 2018, which is a 16-percent improvement over 2017 but 31 percent below 2013. To calculate the consumption of calories and grams of protein per person, we started with the USDA’s FSI usage estimates in tonnes. We subtracted from that a standard seed-use rate of 3 bushels per acre. And because Venezuela does not have an ethanol program, we assumed no corn went into industrial uses. The amounts available for human consumption were then converted to calories and protein using conversion factors for each crop. Simple calculations then allowed us to arrive at a daily per capita consumption rate. Domestic production has long been insufficient to meet Venezuela’s food needs. Currently, Venezuela produces only 30 percent of its food supply. 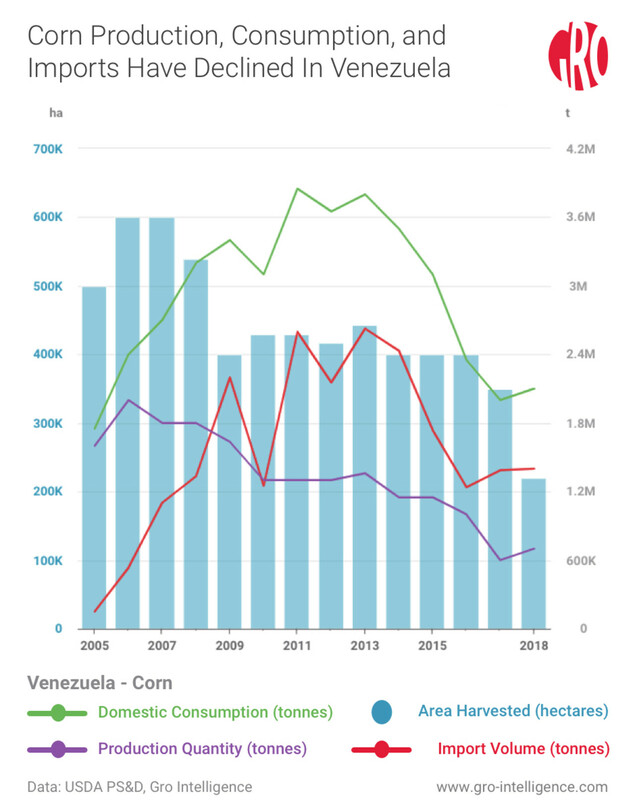 Shifts in planting strategies exacerbate the food shortages; Venezuelan corn producers are switching away from traditional staples into crops that are not under government price controls such as soybeans and cattle, which fetch better prices in the domestic market. Growers also are shifting into crops such as black beans that require fewer hard-to-get fertilizers and other agricultural inputs. 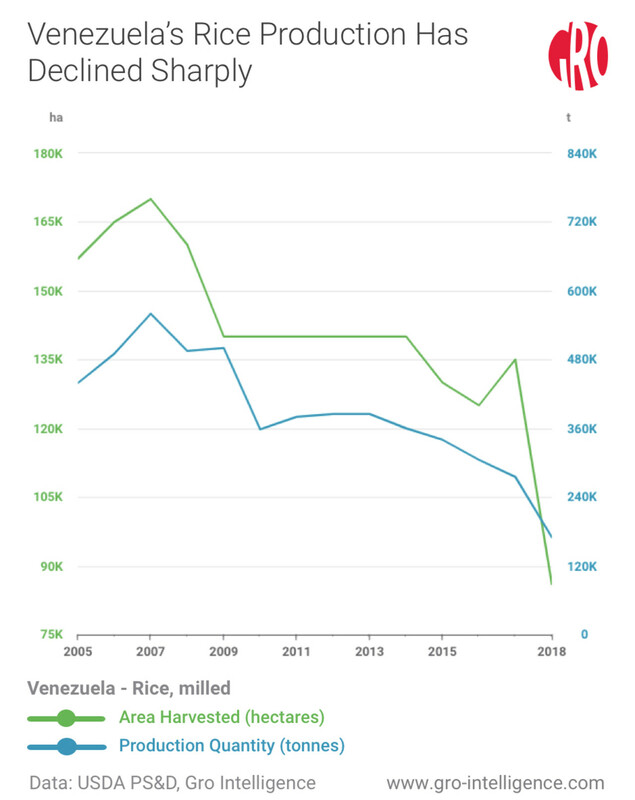 The bulk of Venezuela’s food must come from imports, but revenue from the state-owned oil industry, which has traditionally funded agricultural imports, has fallen sharply. Some 40 percent of Venezuela’s population of 30 million people rely on Local Committees for Supply and Production (CLAP), a government-subsidized food distribution program. Nearly 90 percent of CLAP boxes are imported from Mexico and contain basic foods such as rice, pasta, oil, and sugar. Venezuela consumes more food than it produces. 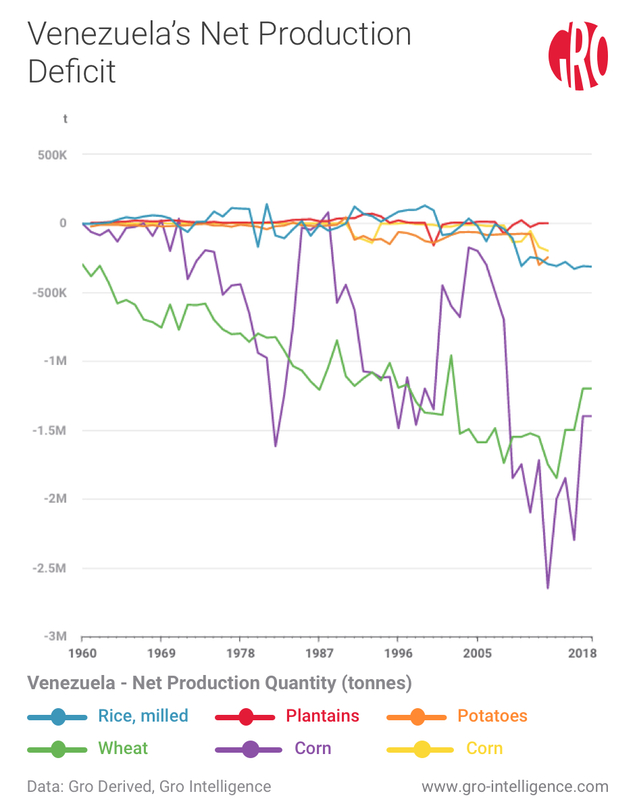 This chart shows net production value, which is determined by subtracting consumption from production, for some of Venezuela’s staple foods including cassava (yellow line), corn (purple line), plantains (red line), potatoes (orange line), rice (blue line), and wheat (green line). 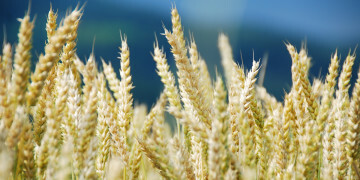 In the case of wheat and corn, there is large deficit between what is produced and what is consumed. Both production and consumption of corn, the most popular grain in Venezuela, have declined since 2013. 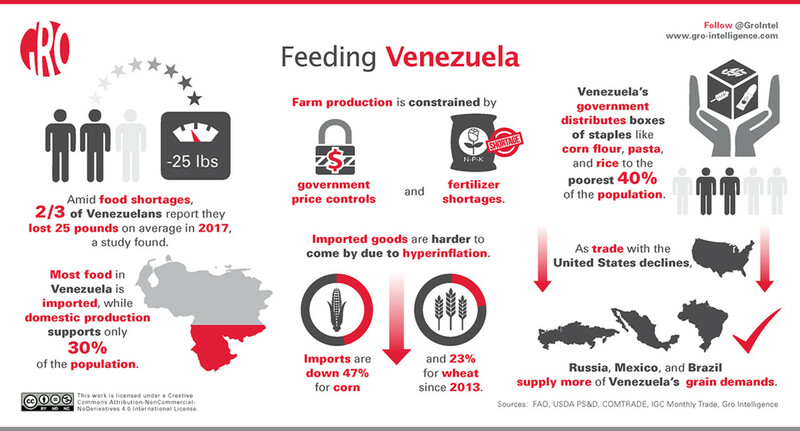 Last year, Venezuelans consumed three times as much corn as was produced domestically. Corn is a major ingredient used in arepas, a kind of cake that is an important staple in the diets of many Venezuelans. But corn is now too expensive for many people, and consumers are shifting their diets to cheaper starches like potatoes and cassava. The USDA estimates a sharp drop in corn area harvested to 220,000 hectares in 2018/19 from 350,000 hectares the previous year. But higher yields should boost production to 700,000 tonnes, helping to offset lower imports, which come mainly from Mexico and the United States. Inflation is having a trickle-down effect on other markets for corn. 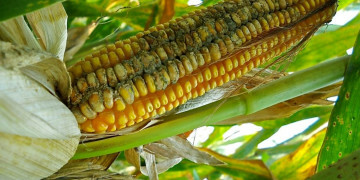 The amount of corn used for feed has dropped by 55 percent since 2013 as poultry and swine producers struggle to cover their costs of production in the face of government price controls. Broiler meat production has fallen 64 percent in the same period and sow count has fallen 66 percent. 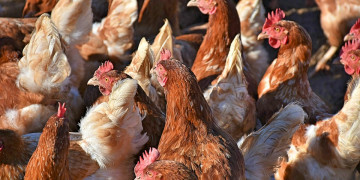 Analysts expect a 50-percent decline in chicken meat production and a 25-percent decline in egg production over the next year. Venezuela’s corn production (red line), consumption (green line), and import volume (purple line), have all dropped since 2013, shown in tonnes (right axis). Meanwhile, area harvested to corn, blue bars, shown in hectares (left axis), has also fallen. As chicken producers struggle to cover production costs in the face of government price controls, corn (blue line) and sorghum (green line) used for feed have dropped sharply. Rice is another major staple food product in Venezuela, and is included in CLAP boxes distributed by the government. The crop is subject to government price controls, which means farmers recoup less than their break-even costs on sales. Venezuelan millers are mandated to sell between 50 and 60 percent of their production to the government at fixed prices. The result is that rice area harvested and production have declined 55 and 39 percent, respectively, since 2013. Scarcity and low purchasing power have pushed consumers to substitute other carbohydrates, including plantains, yucca, and potatoes. The United States has historically supplied the majority of Venezuela's rice, but Brazil is rapidly encroaching on this market by offering cheaper prices. Rice production (blue line) declined sharply in 2018, due in part to shrinking production area (green line), exceedingly expensive fertilizer costs, and government price controls. Venezuela does not produce wheat and relies solely on imports. The USDA estimates that 65 percent of imports is hard red winter wheat and 26 percent is durum wheat, both with high protein contents that are commonly used in pasta products. 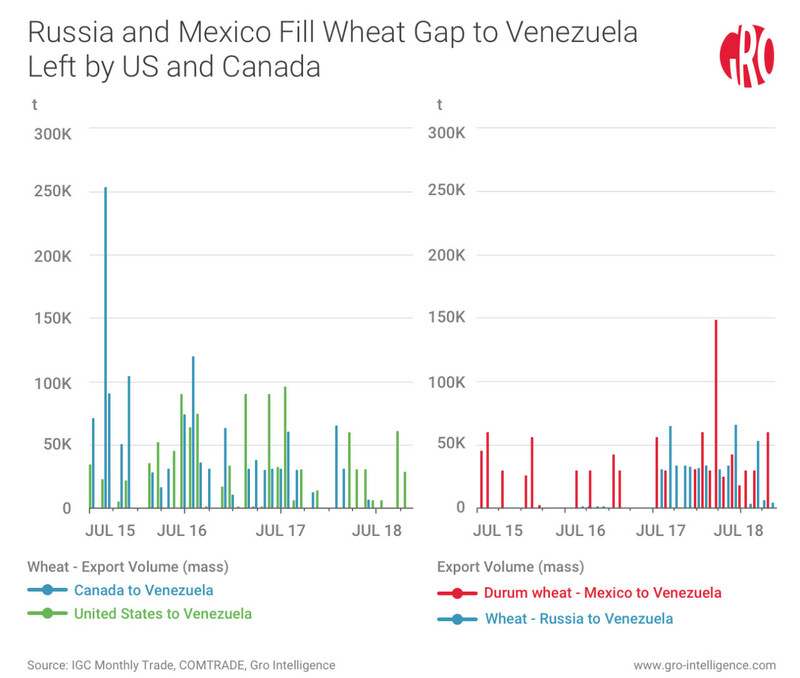 The United States and Canada are the traditional suppliers of wheat to Venezuela, but competition from Russia has been growing in recent years. In 2017, Russia agreed to deliver between 300,000 and 600,000 tonnes of wheat annually, but this figure reached only 223,500 tonnes by the end of that year. Roughly the same amount arrived in 2018, but reports indicate that the Russian wheat was too low quality to produce bread and pasta. Mexico has become another major supplier of wheat to Venezuela. CLAP boxes contain pastas made using higher-quality Mexican durum wheat. 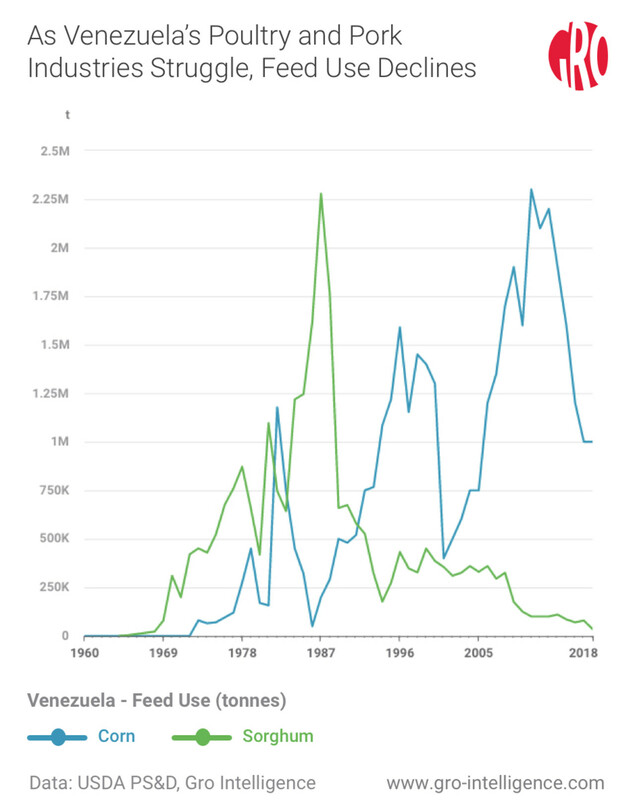 Though historically supported by the US and Canada (left chart), many of Venezuela’s recent wheat imports have come from Russia and Mexico (right chart).